The 1990's are back. How much do you remember? 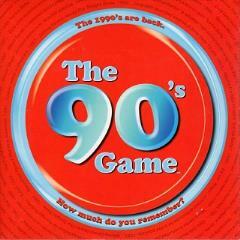 This board game has 3,000 trivia questions in 5 categories about 90's pop culture - Music, Movies, Sports, TV and Events. It's a great gift for anyone ages 13 to 30 - and it?s the perfect party game. Do you remember which TV talk show first features Bill Clinton playing the saxophone? Can you recall which movie actor plays the king in Michael Jackson's "Remember the Time" video? Do you remember which NFL team's mascot is kidnapped in Ace Ventura: Pet Detective? Can you recall which Seinfeld actor appears in Rold Gold pretzel commercials? Do you remember which one-hit wonder sings "Mmm Mmm Mmm Mmm"? From Beverly Hills 90210 to Nirvana to The Matrix to Monica Lewinsky to the Taco Bell Chihuahua - if it happened in the 1990's, it's in The 90's Game.